This probably seems like a dumb question, and trust me, it's not a question anybody else dared to ask as I couldn't find any other thread related to this, but where did the rides that Coney have now come from? But where did the rest of the rides, such as the Trabant, and the Flying Bobs come from? That's been something I always wondered. Those are the only rides that I know where they came from. The Carousel, Scream Machine, Frog Hopper and Eurobungy Dome were all installed new from the manufacturer. I know rides like the Ferris Wheel (manufactured in 1947) and the Scrambler (manufactured in 1945) were at other parks prior to their arrival at Coney, I simply do not know what those other parks or locations were. Actually that was a great question! Along the same lines, does anyone know where the old rides from Coney went after the park closed in 1971? The Whip and any others I failed to mention. I think many of the rides that resided at Coney in 1971 that were not moved to KI in 1972 were ultimately scrapped, unfortunately. Really?... Weren't all these rides relocated? Re-read my post above yours. I stated that rides that were NOT relocated to KI were likely scrapped. And the Turnpike cars that resided at Coney and actually on the shores and over Lake Como were NOT relocated to KI to my knowledge either. I'd always wondered where the newer rides came from because like CoastersRZ said, the original Coney had rides that ended up at KI and were installed into the Coney Mall section. Of course, this also begs the question, "what year was Coney Island retooled after Kings Island was built?" I don't really know all this stuff as I've only been visiting CI for about 6 years or so, so it's nice to have people somewhere who actually have knowledge about this stuff. Well, if you haven`t checked out the extensive history section on Coney Island Central, found here, I suggest you visit it. It will likely answer a lot of your questions. To answer your question, the retooling of the park really began in 1977. That is when they added the Zoom Flume at Sunlite Pool. As far as reintroducing rides to the park, that didn`t happen until the mid-80`s with som small kiddie rides. The Bumper Boats and Krazy Kars (no longer at the park) were added in 1989. The following season, the park introduced the two Eli Bridge rides, the Ferris Wheel (built in 1947) and the Scrambler (built in 1990). So it was right around 1990 when the park really began to build up its rides line up. Ah, thanks for that link, that answered darn near all of my questions about when the rides were installed. Most of them were installed way later than I thought they were. If these rides happen to be in fixable condition, I'd expect Park River Corporation to have their eyes on at least some of them... Right? ^While anything is possible, there is no chance. I could see the whip being a good fit at Coney, but alas while it operated it was one of those older more "cranky" rides. The Belle of LeSourdsville judging by Ronny's photos is in rather poor condition. Of everything you listed the two rides that had some kind of importance were Raging Thunder and Screechin' Eagle, both of which now are rotting away. Newer rides could be had for a cheaper cost, and less maintenance. The ones that I were wondering most about were the Sky Ride and the Train. Both of these would be nostalgic to Kings Island lovers, Coney Island lovers, and Lesourdesville Lake Lovers... All of them, at one time, had both. It seems to me that all the Sky Ride would need are a new cable, and a new paint job. And the train wouldn't be that hard, either. ^No, not that easy, they need a lot of work. The skyride would more than likely need complete refurbishment. In fact all would, to even meet Ohio Department of Agriculture guidelines. These rides have sat in the elements since 2002. The would take A LOT of work. And remember that Coney just installed a multi-million dollar water slide last season. 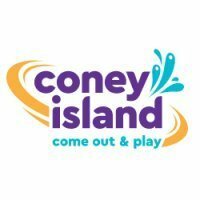 One of the largest investments that Coney has made in many many years. And that investment was on the heels of the 2008 investment which saw three new attractions open on the rides side. Needless to say, 2010 will be an off year for the park adding new additions. Who knows what will be in store in the coming years though. Currently, Coney is bracing for a hopefully minor flood. The Ohio River is expected to crest around 54', or two feet over flood stage. That is enough to flood most of Coney under two feet of water, and shut down Kellogg Avenue. Does it flood all their buildings (food stands, shops) at that level? I believe it does. The security office, which is located in the main parking structure (Gate 2) at the intersection of Kellogg and Sutton, sits at 52' above flood stage. The filter room for the pool actually sits a few feet below the pool deck, which itself is a couple of feet below the main parking entrance structure. As a result, a flood of around 48 to 49' will flood the filter room. The main administration offices are all located on the second floor of the administration building. But there are plenty of food stands, and some offices, including the rides office, that may very well have a foot or two of water in them, depending how high this water level gets. The last time the Ohio got high enough to flood Coney was 2005. The river did come close in 2008, and flooded the filter room, and the deep end of Sunlite Pool. Wow, that a tough element to consider in the construction of anything. I highly doubt the skyride will ever operate again. For one thing it was just an "out and back" skyride. Back in 2002 or 03 (whenever their last season was) I rode it and it was in pretty rough shape. Likely more trouble than it's worth. ^^Wow. That is weird how the water can just get to the deepend without going over any other parts. Did it come up through the drains or what? Can anyone explain smething to me? Ive never been to Coney Island, but once all the rides were moved to KI, wat happened to the park? And then later they decided to start adding more rides back to Coney Island, I don't get it. Not sure what happened right after the rides were removed but I would think someone different owns it now which is why it is currenty open. Read this article on CoasterRZ's Coney Island Central. It should answer your questions on the Coney to Kings conversion. If you want to learn about particular rides, read this. I recommend to anyone, especially KI fans, to check out Coney. I went for a few hours last year before a two day trip to KI with some friends. It's so interesting to walk around there and think of all the history. They have a huge "flood gauge" showing how much flooding occurred during different years of the park's history. They also have some neat things in the souvenir shop. And why didn`t you say hi to me? I likely was working the day you were there at either the Ferris Wheel or Rock O Planes.